Moscow, August 25, Interfax - The number of immoral actions in the Russian Army has significantly reduced thanks to joint work of the Russian Defense Ministry and the Russian Church, Defense Minister Sergey Shoygu says. “The number of immoral actions has seriously reduced. It refers to everything connected with hazing. We have almost eliminated it, if it happens, it takes place in a household level, and does not have any threatening character,” Shoygu said at his meeting with Patriarch Kirill of Moscow and All Russia. He thanked the patriarch for everything he does not only for the army and the navy, but for the whole country. 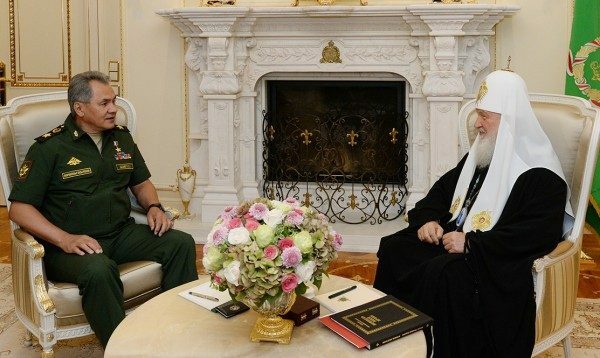 In his turn Patriarch Kirill noted that the Church watches the work of the Armed Forces. “I often have to visit military units, and I can witness to great changes that take place in the army and the navy,” the patriarch said. “I cannot judge about military component, or about operative work or technical component. I can judge about people’s mood and compare these moods. Today, we see rise in the military forces. People believe it has happened because you became its leader, and they pay much attention to it,” the patriarch said.